LO..that looks delicious..btw how do you pronounce that? Damn, it's 1 a.m. and now I'm starving! What's your address? I'm coming over. Ek tho... was so nice to know you've brought up medha well!! lol... i wud be proud if my kid said that too heeeee... doosra...i love the papeta par ida....will make it this weekend with bhatura...chalega na? That looks totally yum! I've never made these but gosh, tempting- the okra version especially so! And the Papeta par Ida looks delicious. Love eggs love them potatoes too!! That looks sooooo delicious. I definately will be making it for breakfast on Sunday moring. 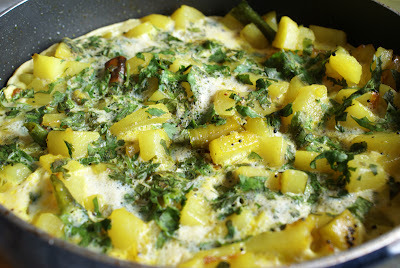 Yes, 6 whole eggs, and this dish is right up my ally - eggs and potatoes - what could be better! Though I did make a very healthy poached egg over winter veggies last year that you may remember...it needs just the one egg (with its yolk) - you try that - I am definitely trying this. ...you could make mayonnaise with it y'know - the real kind? looks gr8!! hard to say he name though..
Looks very nice and delicious. I love that name, "papeta par Ida"...Papeta means potatoes...doesn't it sound like "papita" aka papaya ? Can't pronounce the name? You guys have to be kidding me right? You roll your tongues over what seems unpronounceable otherwise! :-D It's said: puh-pay-tah purr eeda or puh-teh-tah purr eeda. Kitt, drive to Louisville and then follow your nose to the house that smells of Indian food. 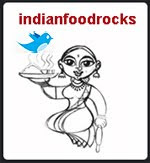 Rachna, bhatura will rock! I wouldn't cos I can't afford to but yeah, why not! Pel, potatoes and okra, both my faves! This is really um, delightful, if it is extra-spicy. And, she has no patience for payasam. Yet. ISG, I bought her new clothes just recently. We really need to do that evening of exchange at school where families bring lightly used clothing and you can pick up whatever you want! Saju, you will love it! Anita, better the yolk down the drain than in my arteries. Moderation allows me to eat one egg yolk and get protein from two egg-whites. Besides, I have always preferred egg-whites over yolks! Shop during sales? Are you crazy? The only reason I went was that the planets had aligned but not completely: she needed pants and I had a 15% off coupon. You should see the crap they sell as clothes. Terrible tees for $20, which have been marked down from $40. I am lazy so I go to one store and that's it. I might try Kohl's online now that I know what she needs and pay shipping instead. But what a colossal waste of almost an hour on a schoolnight. There should be express lanes for people with kids, doing emergency and essential shopping. No mayo for us. I could have made some mousse though. And I have to be gentle with the man-in-the-sink. He threw up on potato peels over the weekend. Luckily I was not to blame. I asked the technician before sending them down. Poor man-in-the-sink. He choked and there was an icky mess under my sink. You guys only saw the WinterSkate and sunset part of my Sunday. See how positive I am? I will live long, ya? Sandeepa, you're right. Papeta means potatoes but the sound in the middle is 'pay' not pee. Hee! Hee! Sales cost me in time because there is always that one woman who bought every trinket in the store and she's in front of me in the line. We were so focused yesterday but it backfired. I mean what was I thinking! Going shopping at 4 pm on a schoolnight for stuff we need! 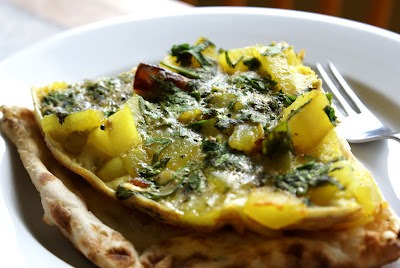 Seema, call it eggs over potatoes and be done with it. No-one will mind or care. And not minus all the yolks although you could do that. I keep one egg yolk from every two eggs I use. You really should try kheer, you know. It's time. Can I come over to your house one day? That potato dish just looks os yummy! I want to make them but I do not have any of the spices or the leaves that you talked about. We should go shopping together sometime. this looks delicious. spicy too... perfect for the weather! when people rave about the spanish omelette (tortilla with potatoes and eggs), i think to myself, they haven't tasted papeta par eda. Heee...and I was feeling so sad that we never shop when there is sale. I hate to shop when there is crowd. And I am the one with more patience among me and hubby :). I was feeling bad yesterday to waste one coupon we had and we could not go for shopping. Hey, Medha is a really cool girl :). You indeed have raised her well. Standing in the lines is not my cup of tea either. Papeta par eda looks really good! I don't enjoy eggs, but if you make this for me, i'll try for sure :). 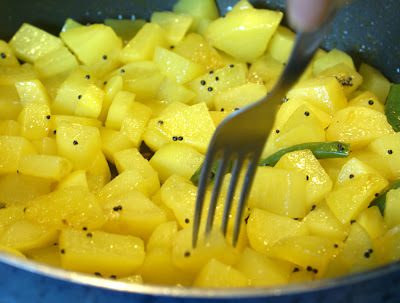 Papeta par Ida ( I find it difficult to pronounce just like Sri..) whatever looks delish Manisha! its indeed a feast to eyes for an eggeterian like ME!